September | 2017 | Cooking is Fun … Really!! I have texture issues so when it comes to buying fruit to eat out of hand, bananas are NOT my first, or even fifth, choice. But for reasons that don’t warrant going into, I ended up with a single banana ripening on my counter. 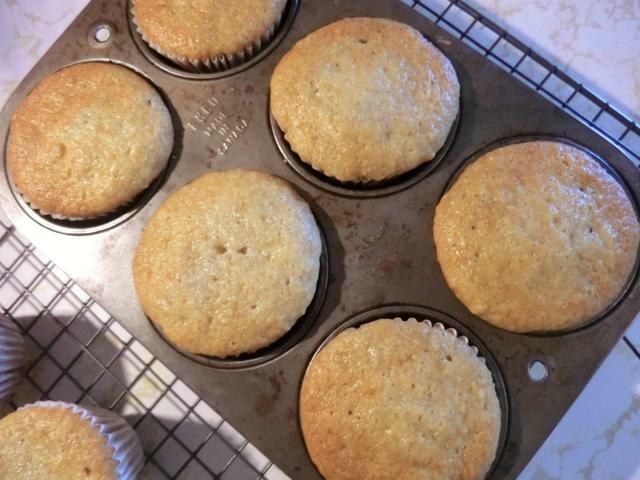 I decided to make banana muffins so I googled for an appropriate one banana recipe. 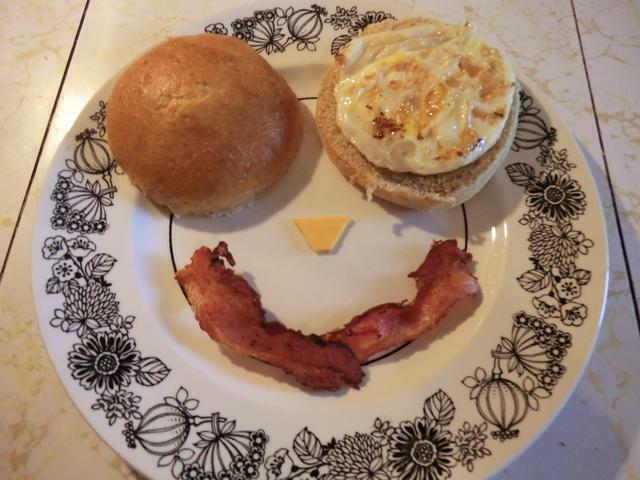 Serenity Now‘s blog had what looked like the perfect recipe for me, but I made some changes. * Add the egg and 2 tbsp sour cream to a measuring cup, and then enough milk to make 1 cup. 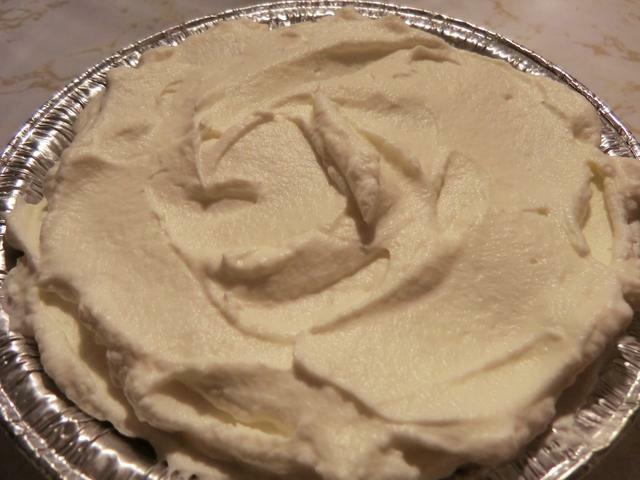 Baking soda likes some acid to help it act in baking but since I didn’t have any yogurt, I used the sour cream. ** I was short of butter so I decided to replace it with vegetable oil. 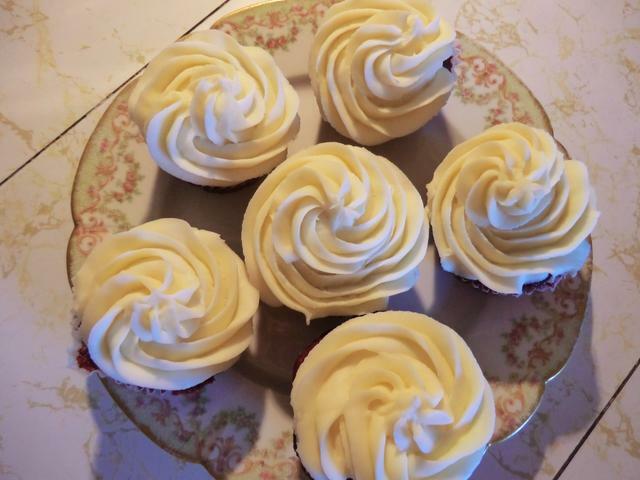 Since my banana wasn’t over ripe (I didn’t want to wait until the next day to make these), I replaced the additional 2 tbsp vegetable oil with maple syrup to sweeten the batter. In a large mixing bowl, break up the peeled banana and cream with the sugar, using a hand blender, until the banana is pureed. 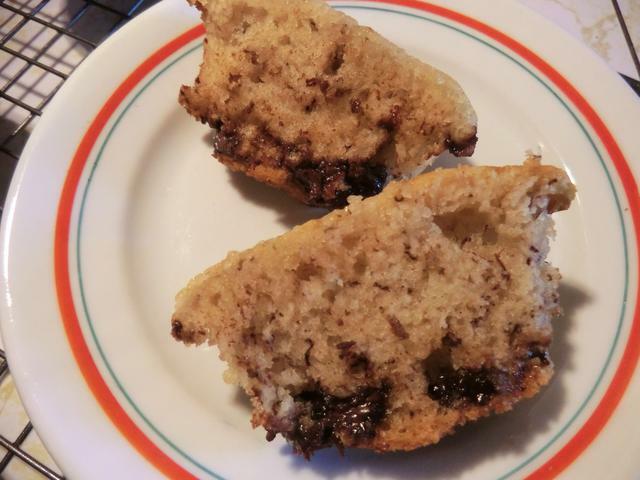 Fold in the nuts or chocolate chips and, using an ice cream scoop, fill the muffin tins. 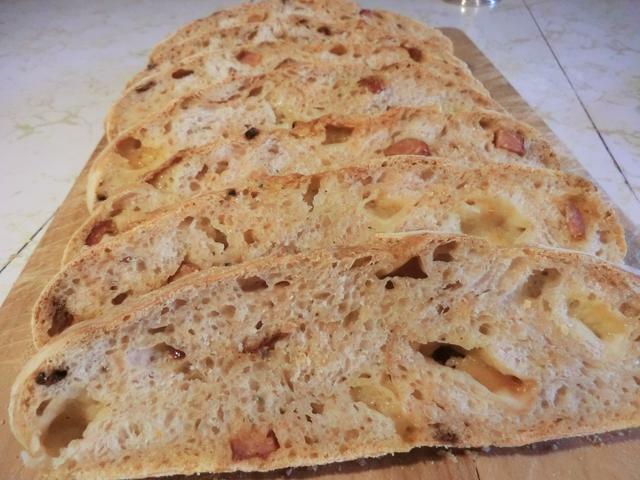 NOTE: If baking in a loaf pan, you’ll need to bake this for 50-55 minutes depending on your oven. 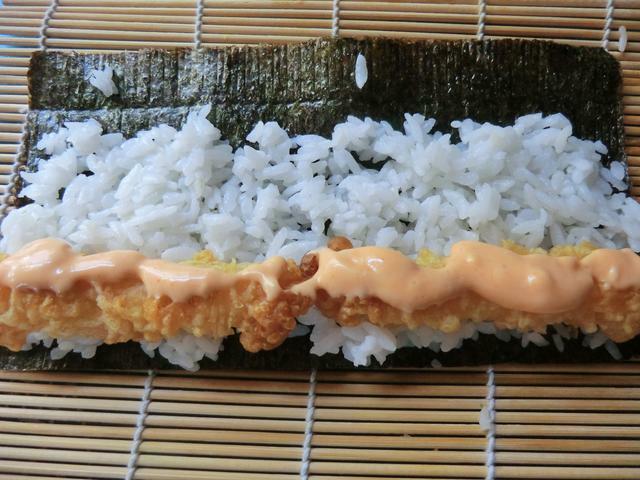 I get periodic sushi cravings and try to shop appropriately for making it at home cause I’m trying to be financially responsible when it’s a choice between a tank of gas (or getting my grass cut) and going out for sushi. I had bought an avocado a week (or more) ago, and I had a package of tempura shrimp in the freezer. 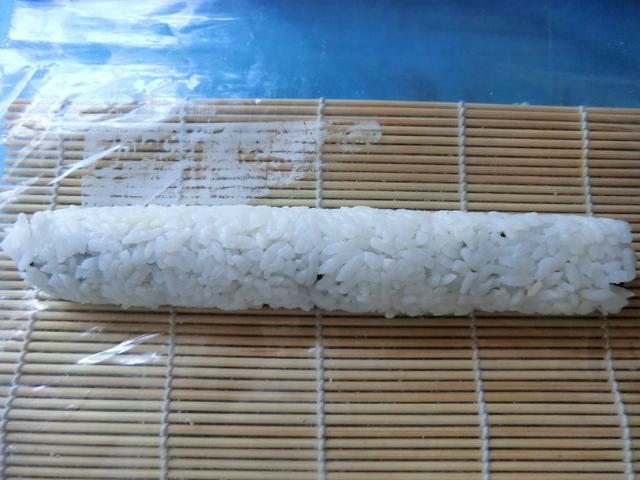 I was going to make tempura shrimp onigiri, but … plans change. 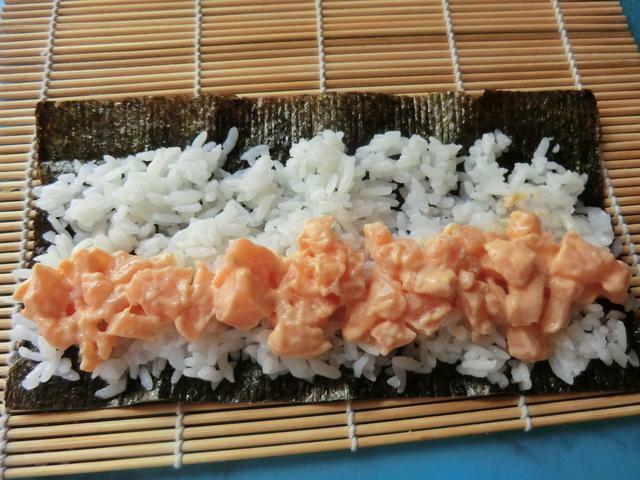 I had good quality salmon in my freezer and decided to risk raw salmon rolls. When I cut into my avocado it was bruised and yucky. I couldn’t save any of it so it went into the garbage. Luckily, I bought a mesh bag of little avocados a few day ago so I cut into the ripest looking of the bunch. 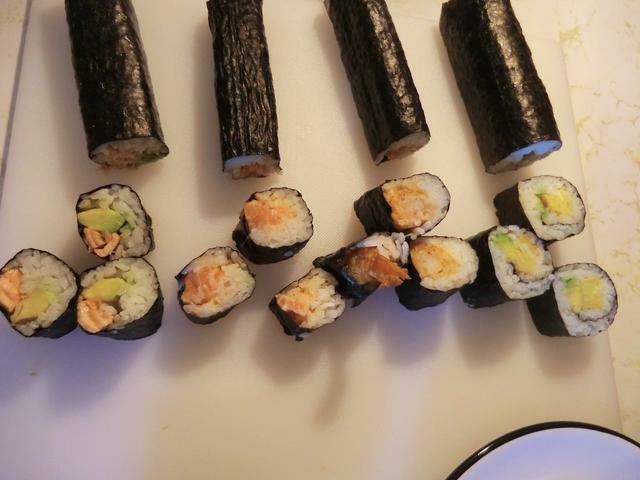 After making four pretty boring regular rolls on Saturday: spicy raw salmon, spicy tempura shrimp, tamago (sweet omelet) and avocado, and baked teriyaki salmon and avocado, I challenged myself with two specialty rolls on Sunday. 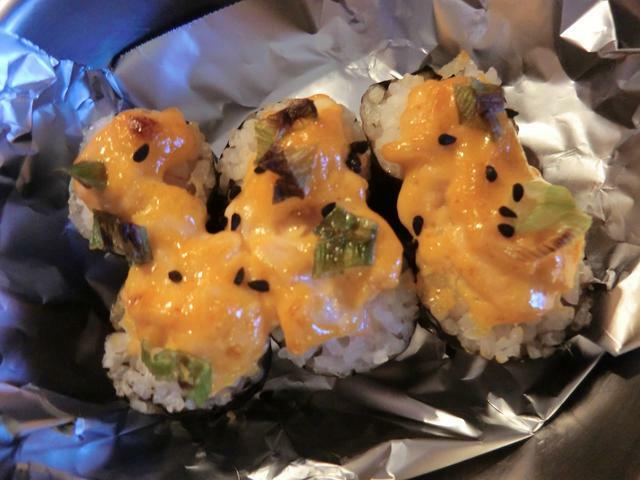 Volcano Roll – There are different kinds of volcano rolls depending on where you go. Classically, julienned cucumber sticks and cream cheese fill the rolls. 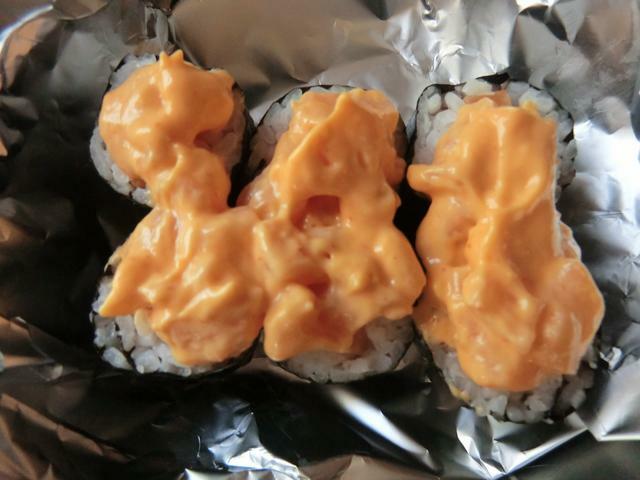 Then, they’re sliced and topped with a mixture of mayonnaise, Sriracha and some sort of seafood. 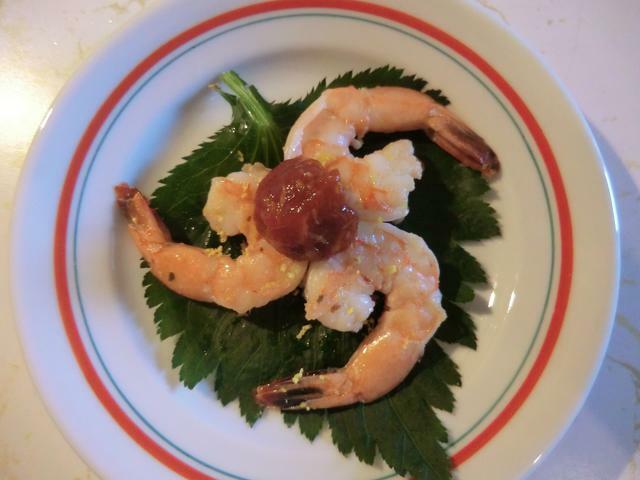 (I’ve had shredded fake crab legs but you can use diced raw shrimp, salmon and scallops, alone or in combination.) 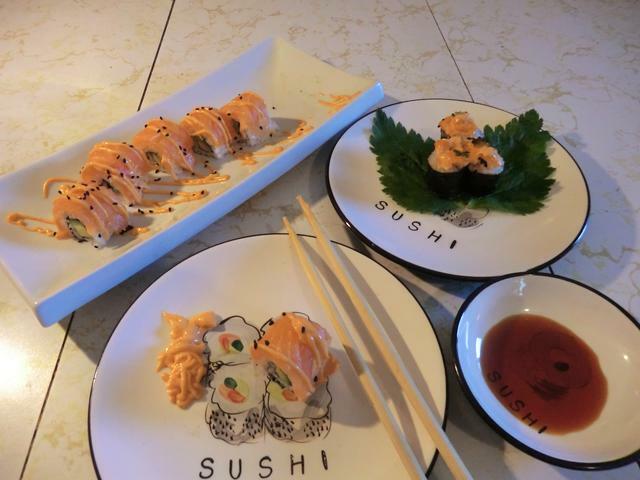 The topped rolls are placed in a toaster oven, or put under the broiler in your regular oven, until the topping is hot and bubbly and browned and the raw seafood is cooked. 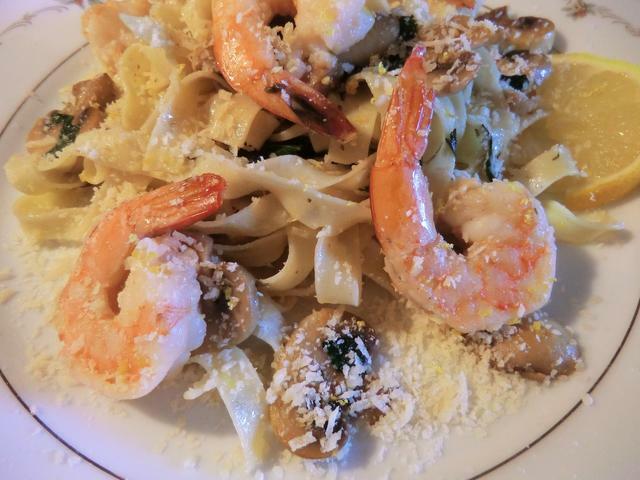 I’ve read that shrimp may take a bit longer to cook so you can partially saute them before adding them to the mixture. Or just use cooked and thawed shrimp. Since I didn’t have any cream cheese and I don’t care for cucumber, I was going to use sliced avocado in my volcano roll filling. 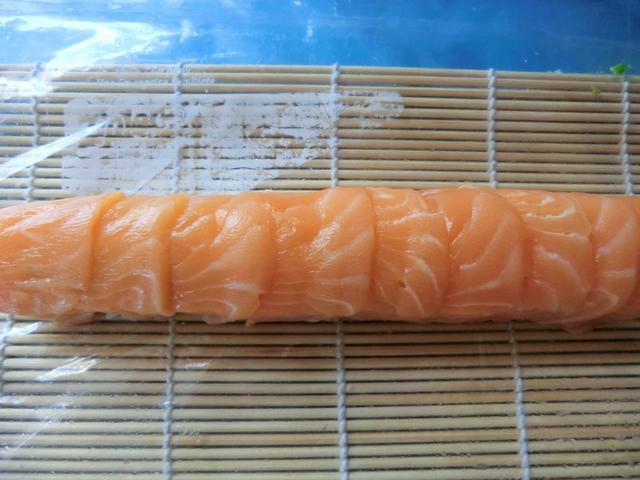 But I got distracted and used the strips of raw salmon that I was going to use in the red dragon roll. You can also use roasted asparagus, sweet potato or yam. I didn’t have any fresh green onion to garnish with so I topped the roll with frozen sliced green onion before baking. A bit wilted but they gave the volcano rolls a nice look. 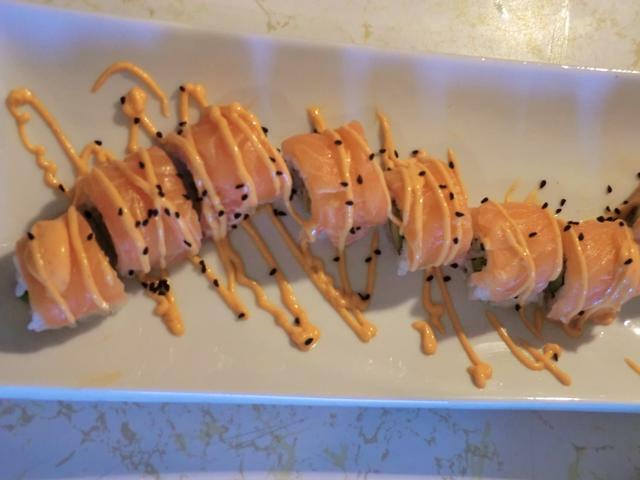 Red Dragon Roll – This is a roll within a roll. The red dragon roll I’ve had at my favourite sushi restaurant is an inside out roll filled with tempura shrimp, sliced avocado and julienned cucumber. 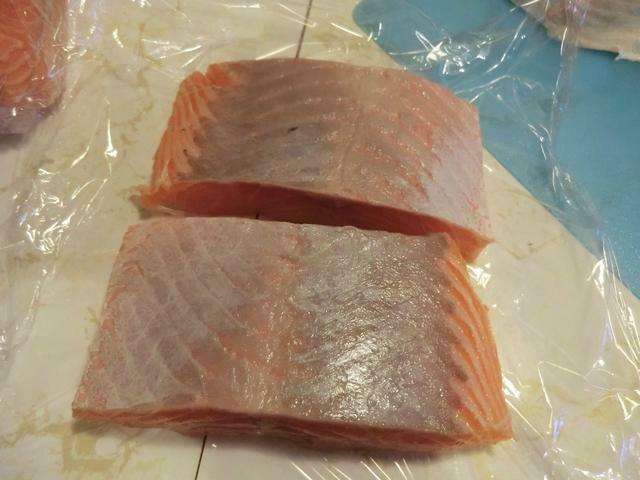 Thin slices of raw salmon are overlapped over the top. 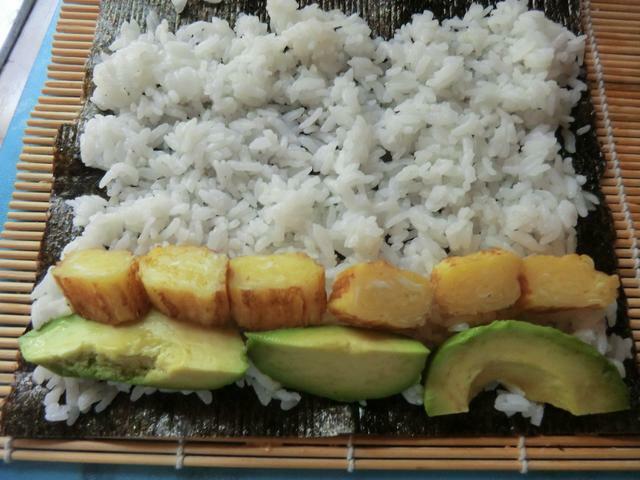 The green dragon roll is covered with overlapping thin slices of avocado. 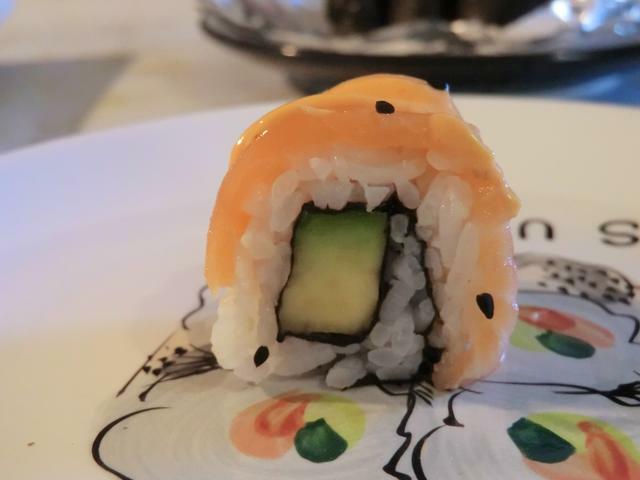 There’s a rainbow roll which has alternating bands of salmon, sea bass (or white tuna) and avocado. 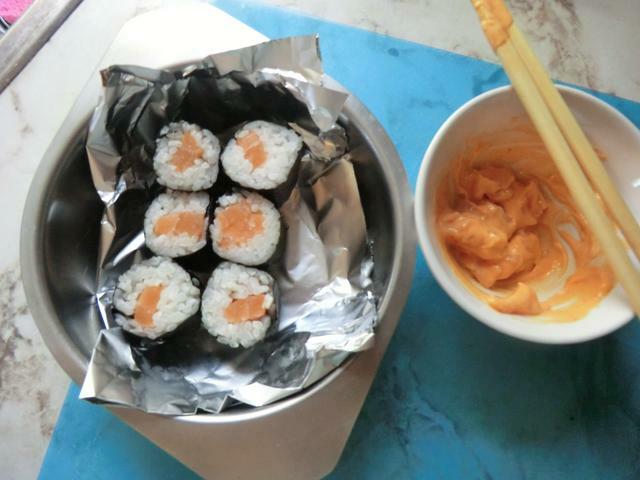 The latter is my favourite but I didn’t have a second kind of raw fish so I stuck to the salmon. 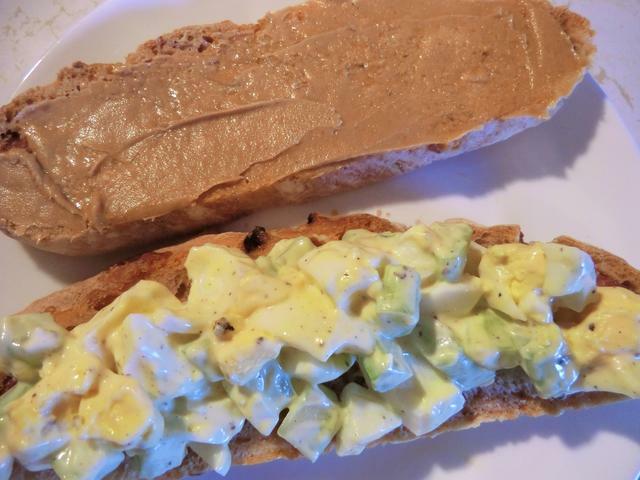 The filling was just sliced avocado. 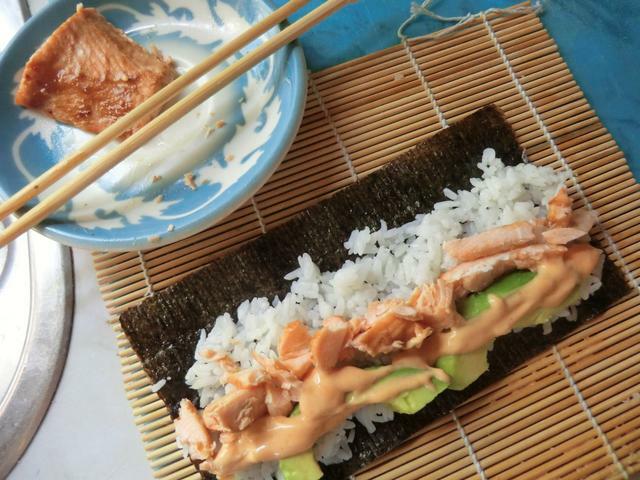 Cover the roll with a sheet of plastic wrap and use your sushi rolling mat to press down and firm up the salmon covering. 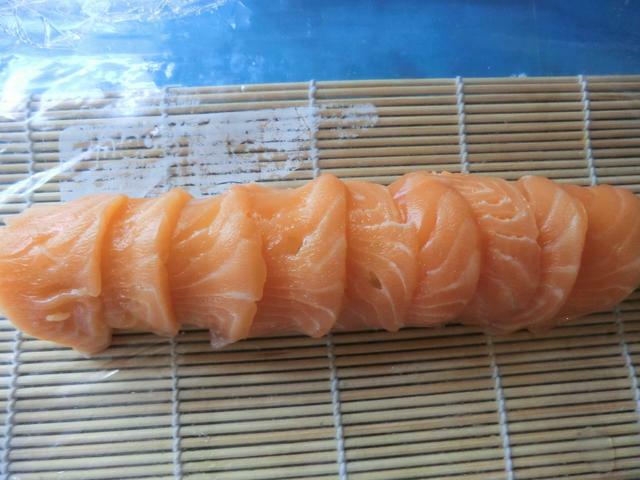 Leave the plastic wrap on the roll and cut through it so you don’t mess up the salmon layer. 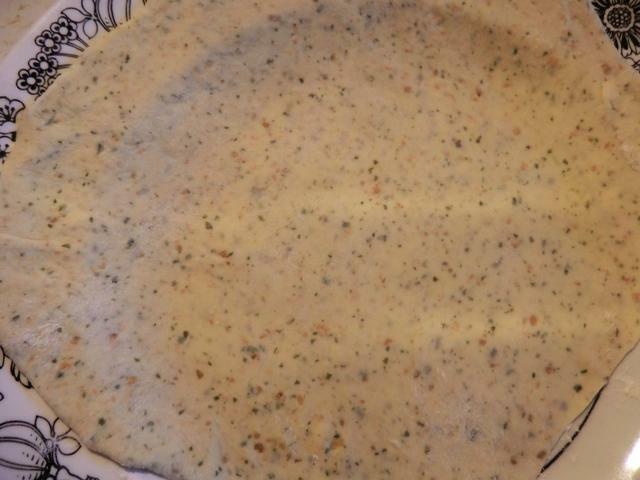 Then, garnish with black sesame seeds or nigella seeds and volcano sauce (mayonnaise and Sriracha). Nothing too exciting happening in the kitchen. I made an attempt at a type of hand shaped pasta, called strascinati rigati, using a sushi rolling mat, but the results were a bit disappointing. 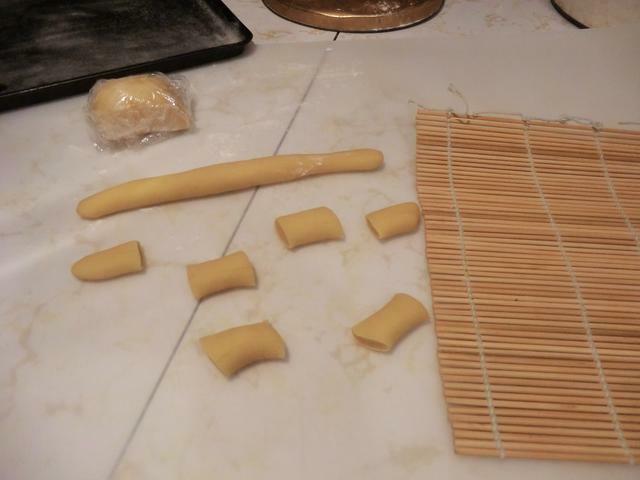 Next time, I’d roll the pasta much thinner and cut smaller pieces for shaping. I’d also cook them fresh rather than drying them. 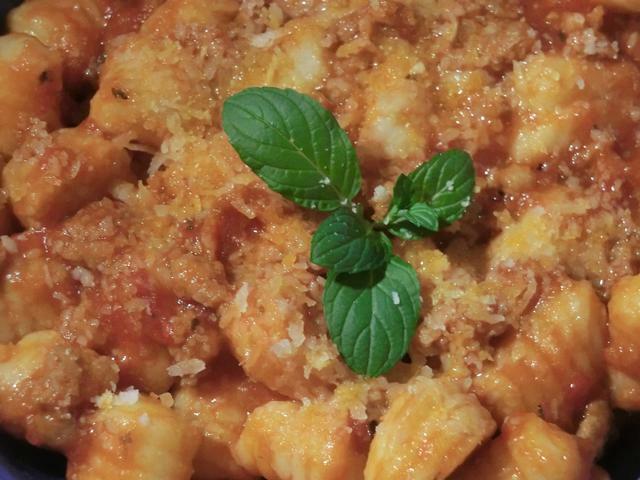 Taste wise … well, it’s pasta with a home made marinara sauce. 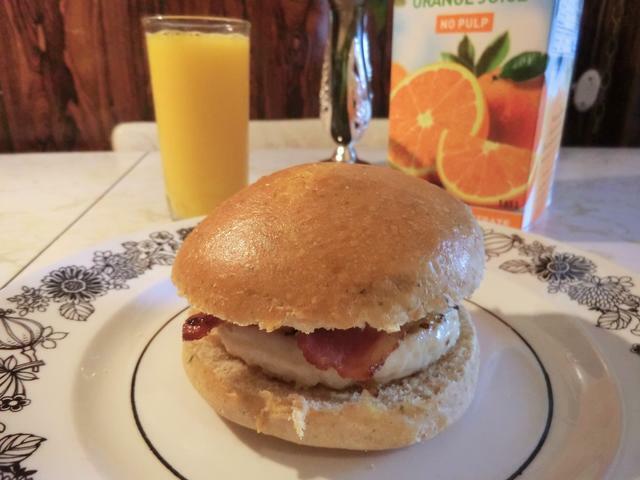 Tasty but nothing to write home about. 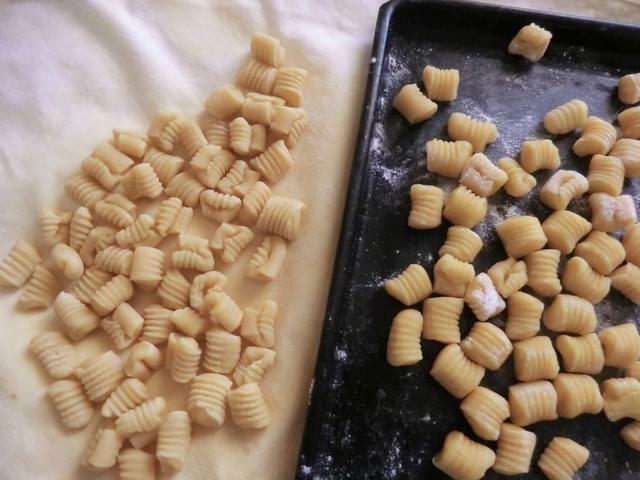 The pasta on the left was made only with all purpose flour while the pasta on the right used half fine ground semolina flour as well. 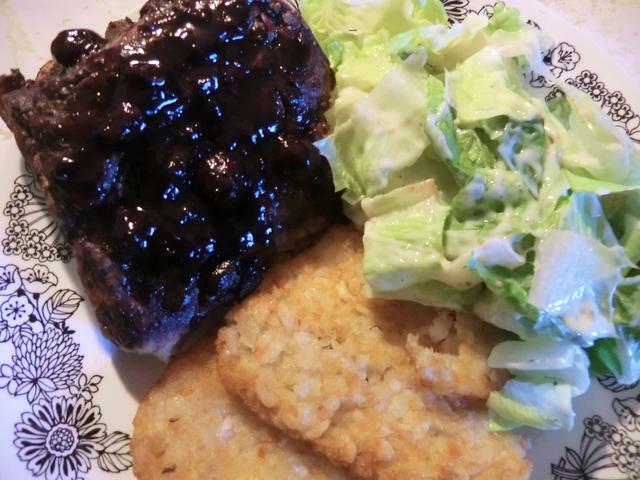 Once again, the freezer is providing the start of some great meals … leftover pork ribs (remember that blueberry bbq sauce) with purchased hash brown patties. 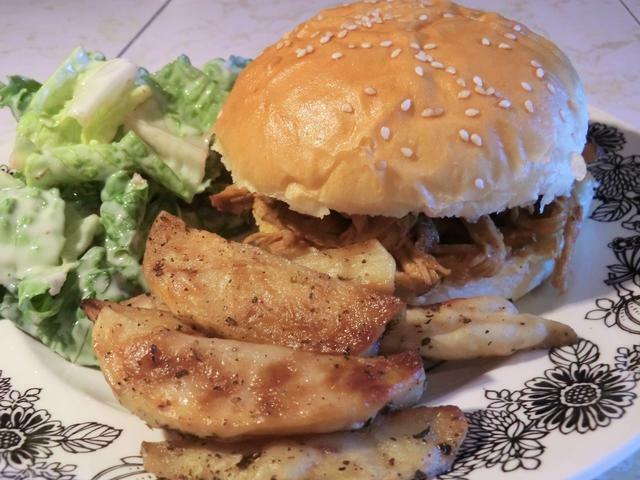 And pulled pork sandwiches with roasted potato wedges. I had a sirloin steak in the freezer so I thawed it out, seared it in a cast iron frying pan and served it rare. 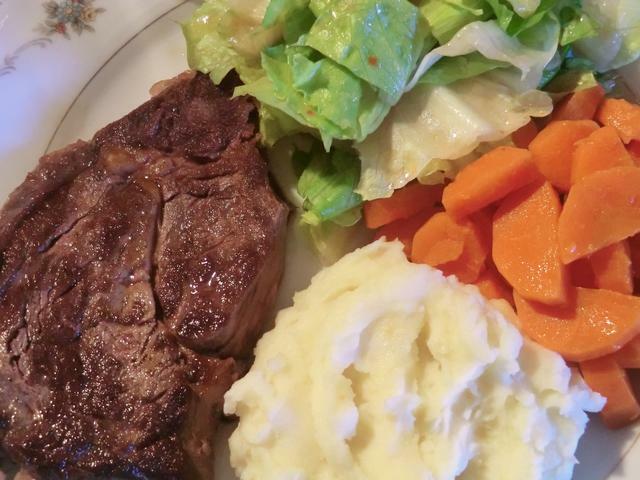 Simple but delicious with mashed potatoes, carrots and salad. There was enough steak leftover for a steak sandwich too. 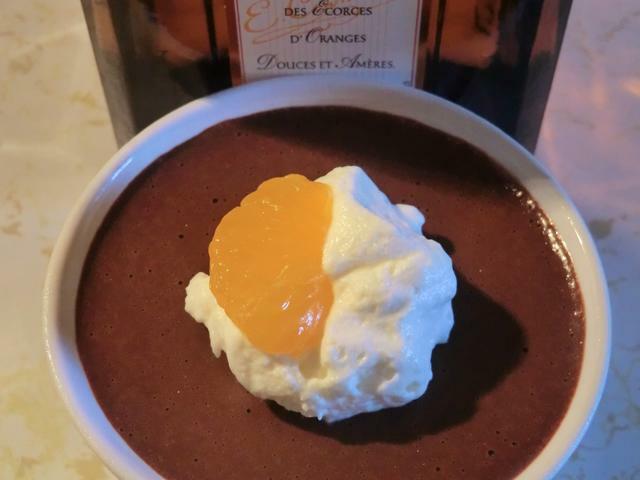 I had a bit of a chocolate craving so I whipped up some blender chocolate mousse/pot de creme, flavoured with orange liqueur (Cointreau), to pour into a couple of prebaked pastry shells from the freezer. 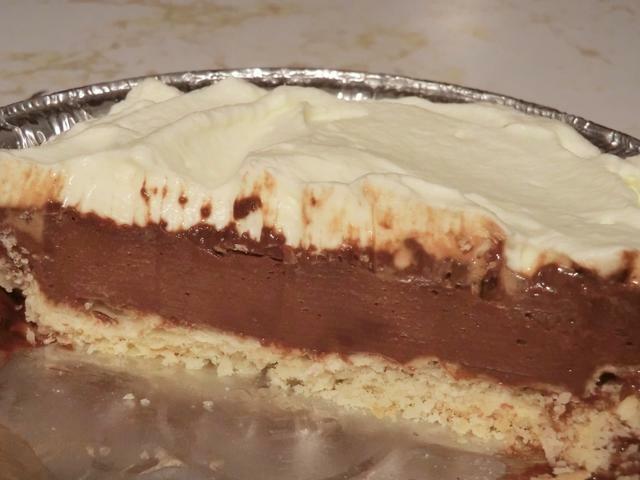 I had visions of something like a chocolate cream pie but since the shells had shrunk so much, not much of the mousse fit into the shells. So, I poured most of the mousse into a couple of ramekins and topped them with a dollop of whipped cream. 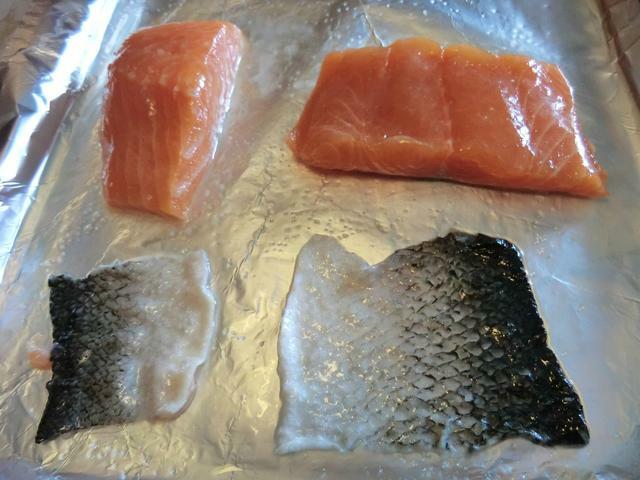 Recently, I picked up a whole fresh salmon filet at Costco and, when I got home, I portioned it up so I could freeze it for future meals. 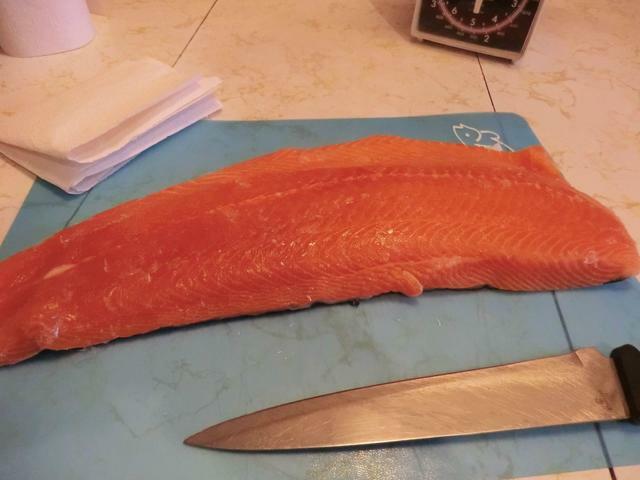 It wasn’t as pretty as this wild caught Canadian salmon, that I got for a crazy cheap price some years ago, but I cut it up the same way so I’m recycling pictures from an earlier post on LJ. 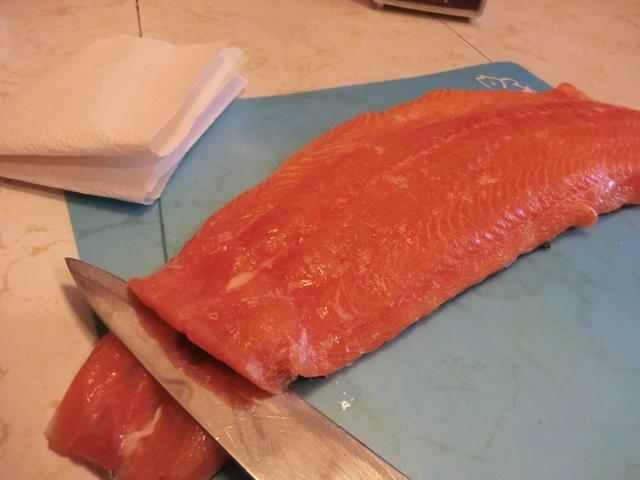 If you have a sharp knife, and are confident in your knife skills, you can hold on to the tail with a folded over paper towel and run a sharp knife between the flesh and skin from the tail to the head portion of the filet. However, once you make that first cut through to the skin and get about an inch under the flesh, you can remove the knife and use the back edge of your hand ‘in place of the knife’ to free the flesh from the skin while firmly holding on to the tail. There’s no risk of cutting the skin or hacking up the underside of the flesh if you use your hand. Which is what I did. 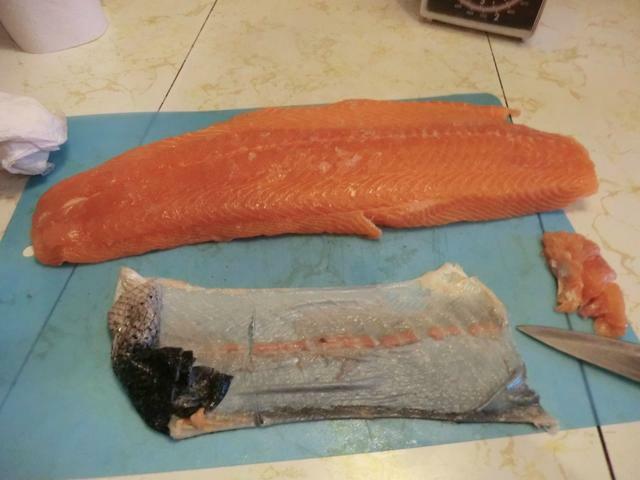 The result is a sheet of salmon skin, a cleaned filet and the couple of inches of salmon from the tail cut off the skin. 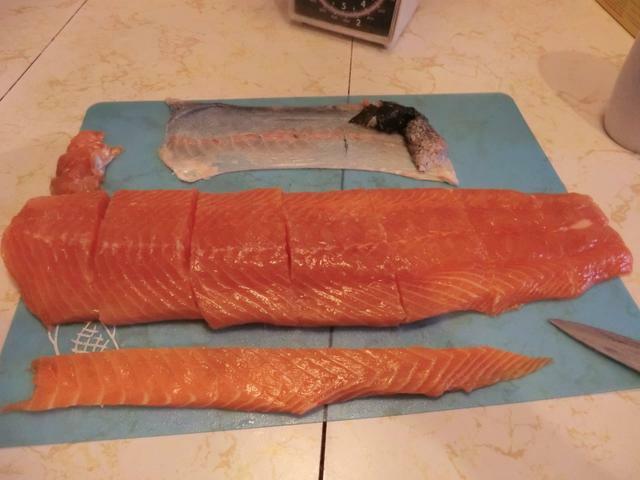 I flipped the cutting board around, trimmed the fatty belly meat off and then portioned the rest of the salmon into 7 portions. 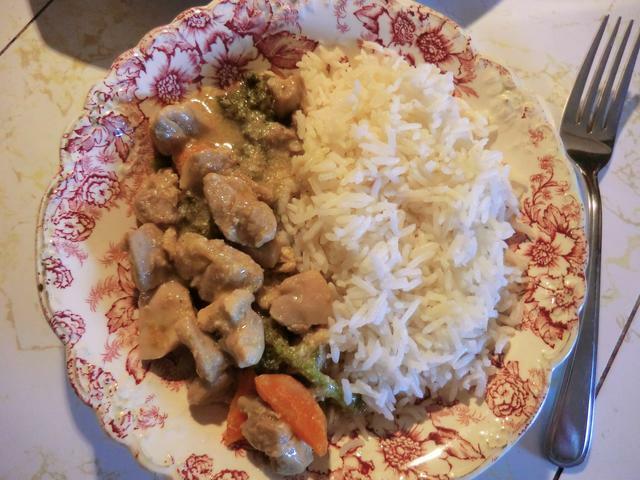 I used the width of 3 fingers as my portion guide. The weight of each portion ranged from 3-5 oz depending on the position on the filet. And, what I ended up with … wrapped for the future. 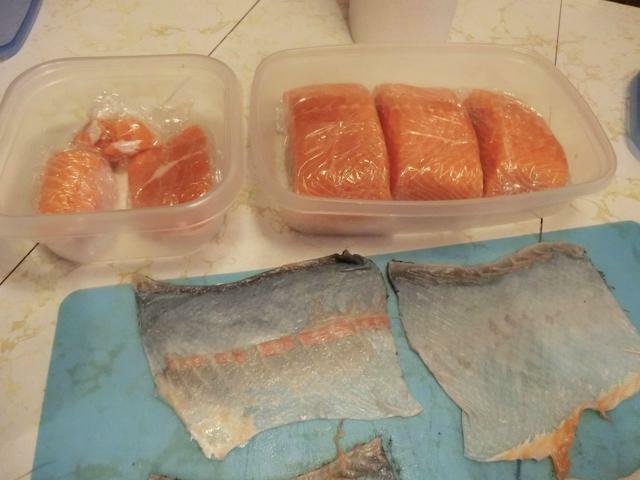 On the right, in the Ziploc container: 6 lovely salmon portions wrapped up in pairs of similar size and weight. On the left, in the smaller container: the scraps from the tail portion that I used to hold onto when I removed the skin from the rest of the filet, the next tail portion, and the belly meat cut into about 5 strips. 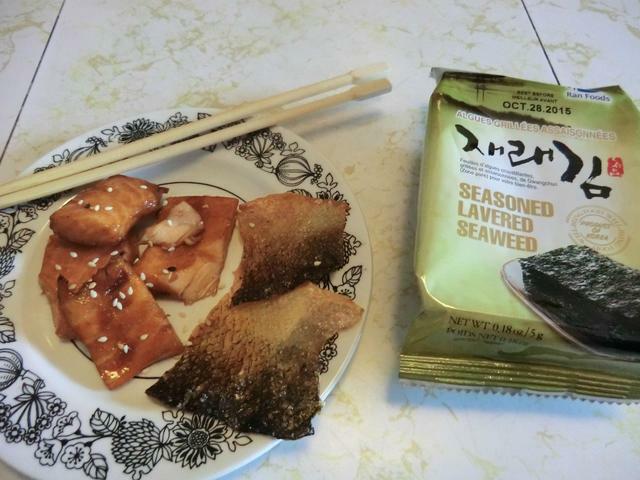 The salmon skin was baked until crispy and served with seasoned seaweed. Preheat the oven to 375 deg Farenheit. 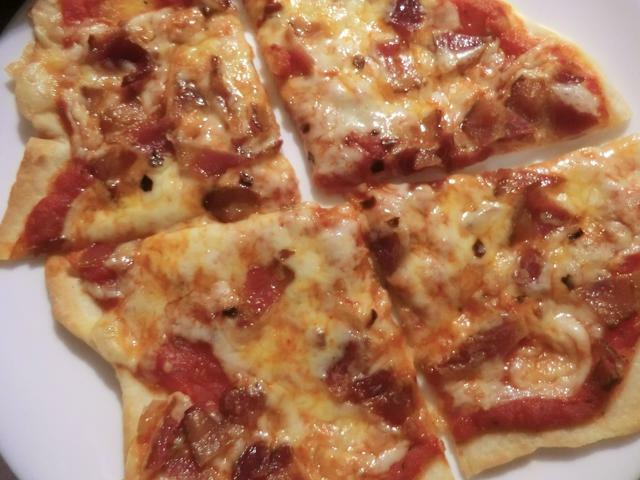 Place a sheet of parchment paper or aluminum foil brushed with oil on a baking sheet. 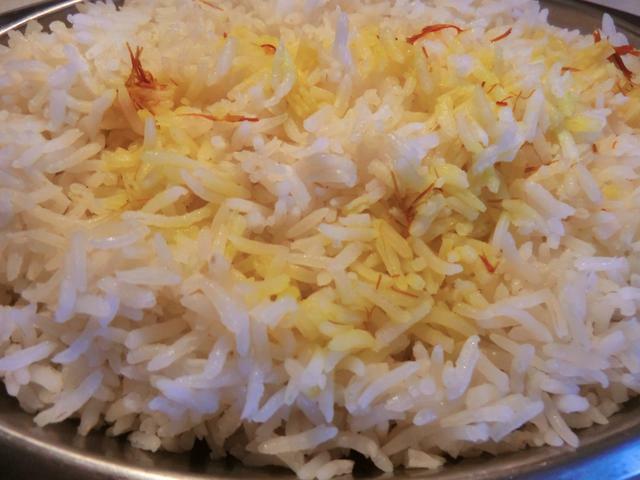 Cut the skin into approximately 2 by 3 inch portions. 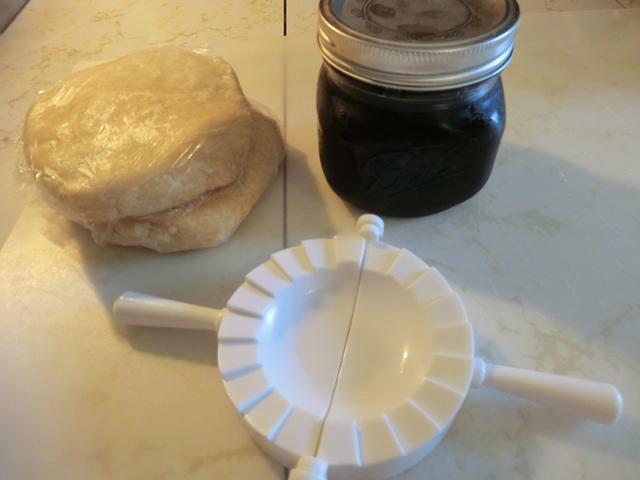 Use a pastry brush to brush both sides with oil and sprinkle with a pinch of salt. 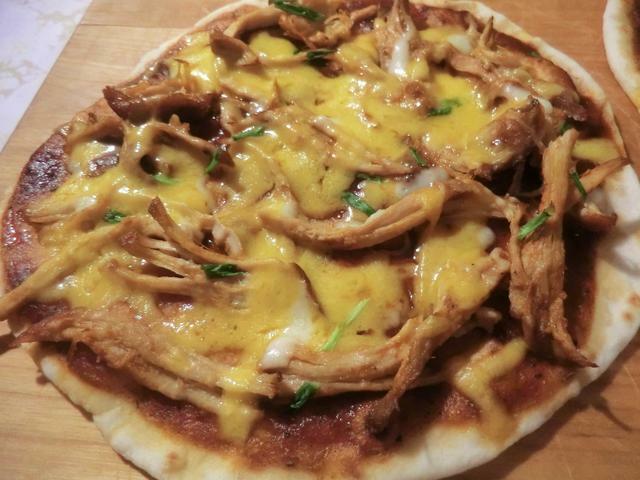 Place on the baking sheet. 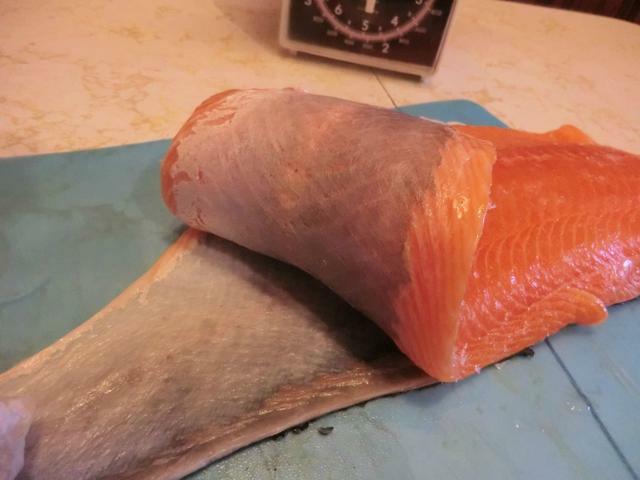 Bake for 20 minutes, turning over the skin after 10 minutes. 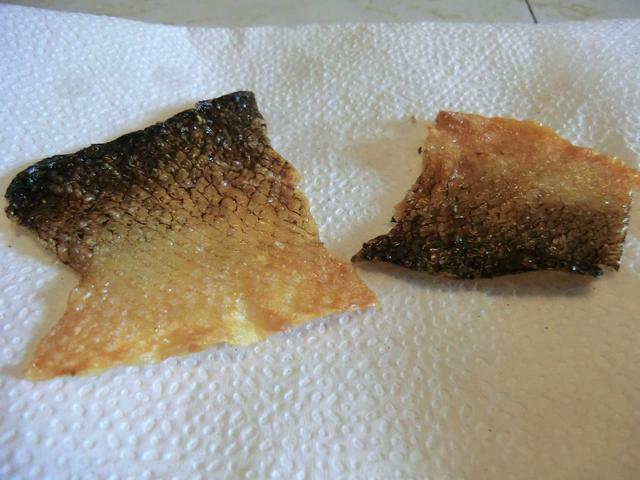 Remove the skin as it crisps up. 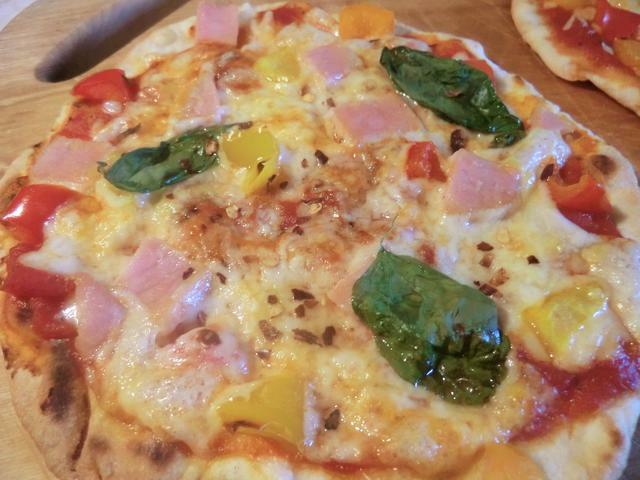 Some pieces may be slightly thicker so may require an extra couple or three minutes. Transfer to a doubled sheet of paper towelling and let cool. Cut or break into shards and use as garnish. 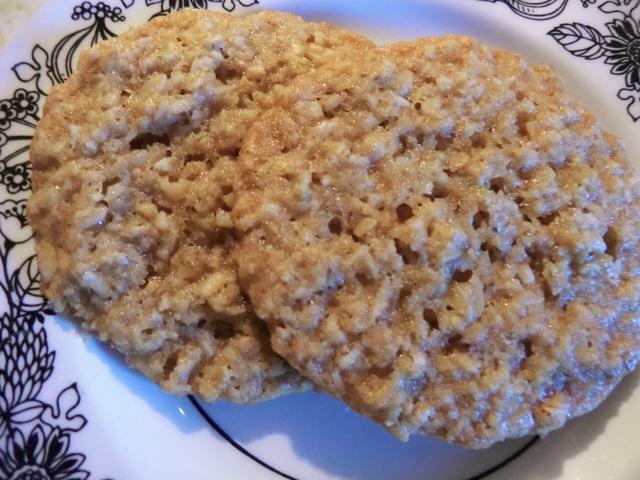 I enjoyed the taste of the last batch of oatmeal cookies that I made … but the ‘look’ didn’t thrill me. These, on the other hand, are very photogenic. And they taste good as well. Not overly sweet … next time, I’d use half the amount of salt though cause the margarine, which I used instead of butter, was salty enough. 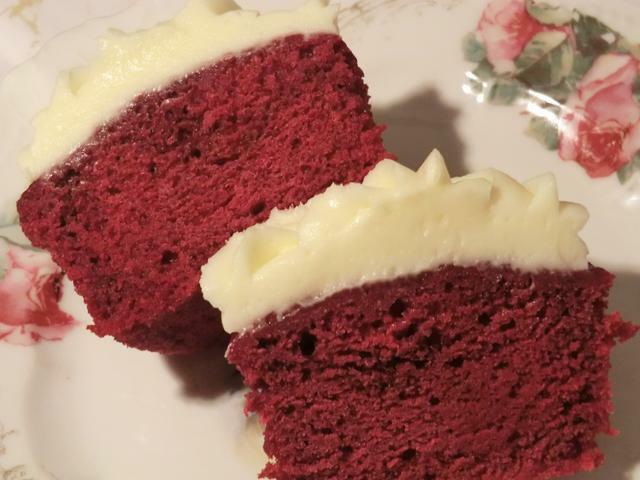 This recipe also came out of Edna Staebler’s “Cookies and Squares with Schmecks Appeal”. 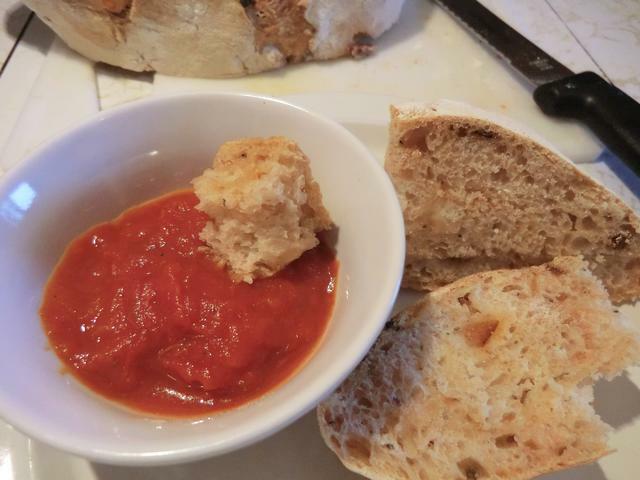 The kitchen was a bit warm for September (77 deg F) so, by the time I had mixed up the dough and started shaping it into 1 inch sized balls, my dough was pretty sticky. I persevered and then refrigerated the resulting cookie balls. 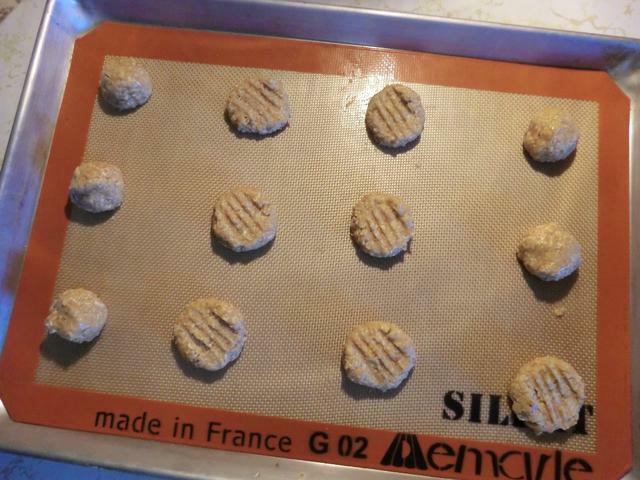 After 30 minutes, I used the back of a fork to press down gently on the cookie balls in order to flatten them and baked the cookies for 14 minutes, instead of the 12 minutes recommended, in a preheated 350 deg F oven. 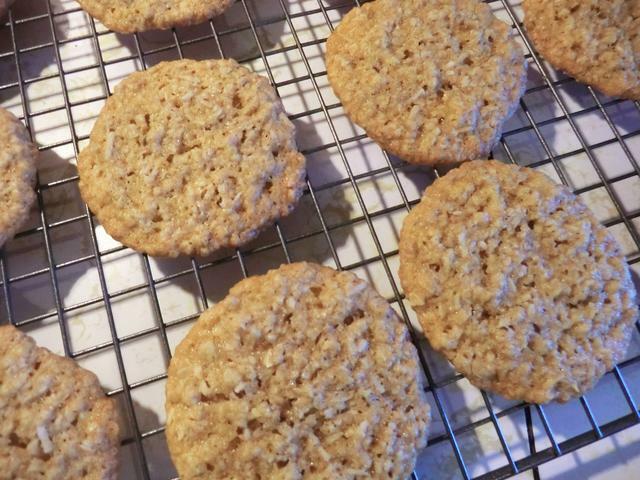 I left the baked cookies on the baking sheet to cool for about 10 minutes, before using a thin metal spatula to transfer them onto the cooling rack, to finish cooling. 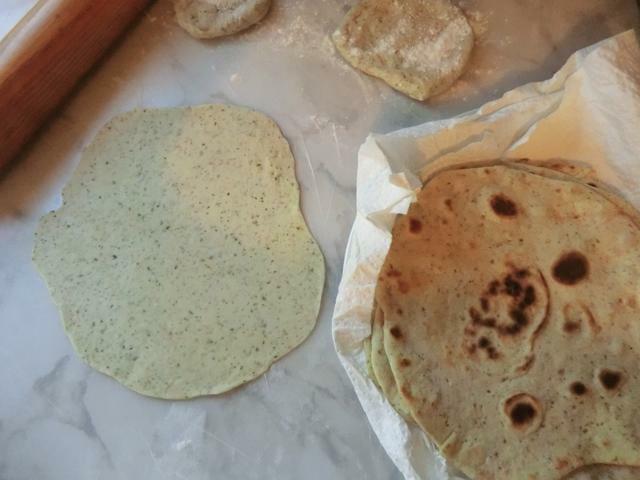 I used to buy various flavoured tortillas … pesto and jalapeno cheddar come to mind, so a recent FB post which mentioned a rosemary olive oil tortilla inspired me to flavour my own home made sourdough flour tortillas. 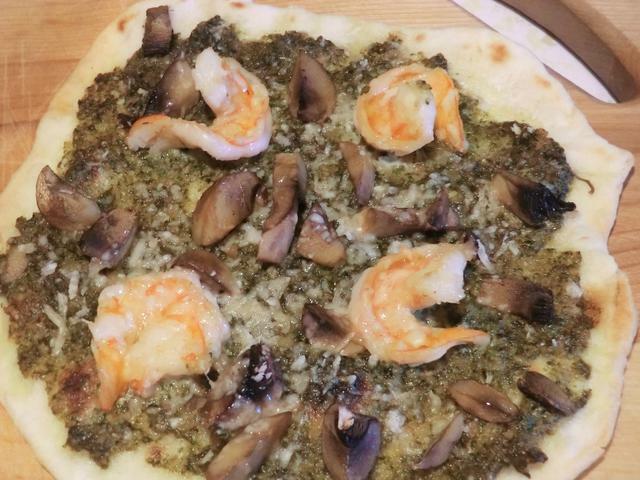 I was going to add dried rosemary to the sourdough tortilla dough but the jar of pesto, which caught my eye, when I opened the fridge door, led me in another direction. 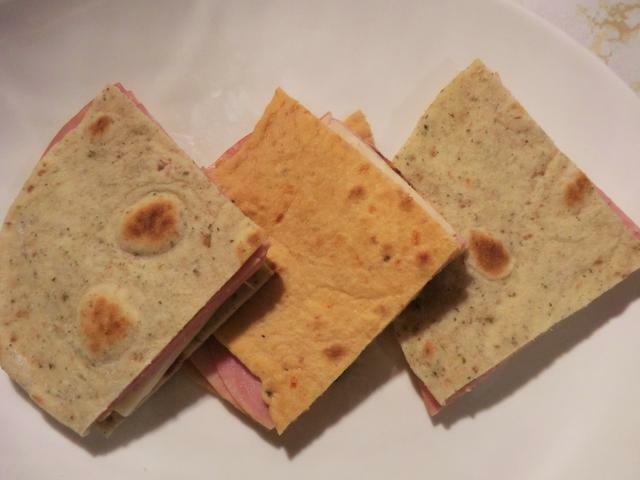 Shiso pesto tortillas … one tablespoon of the vegetable oil was replaced with pesto. 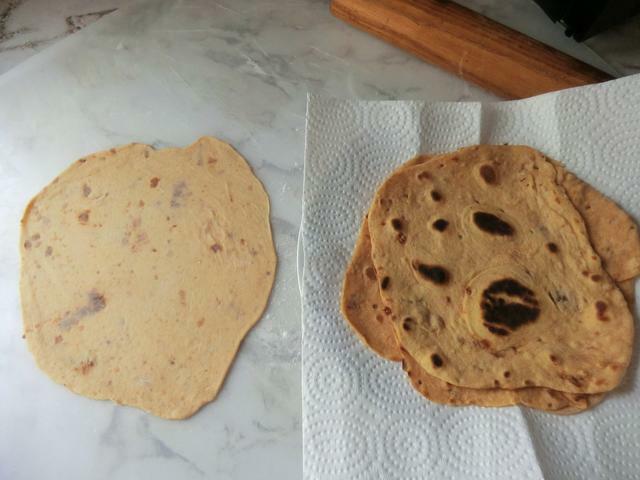 For these sun-dried tomato tortillas, I pureed 2 tbsp of sun-dried tomatoes with the water in the recipe and added 1 tbsp of tomato paste for colour. 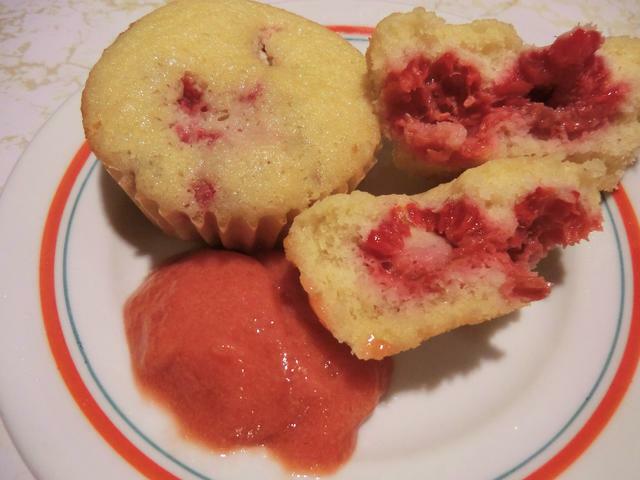 A couple of pinches of sugar were added as well as I was afraid the tomatoes would be a bit … bitter. They were fine, by the way. Other flavours I’m thinking of making one day … chipotle in adobo, roasted garlic, roasted red pepper, spinach, sun-dried tomato and garlic. What do you think would be a great flavour? 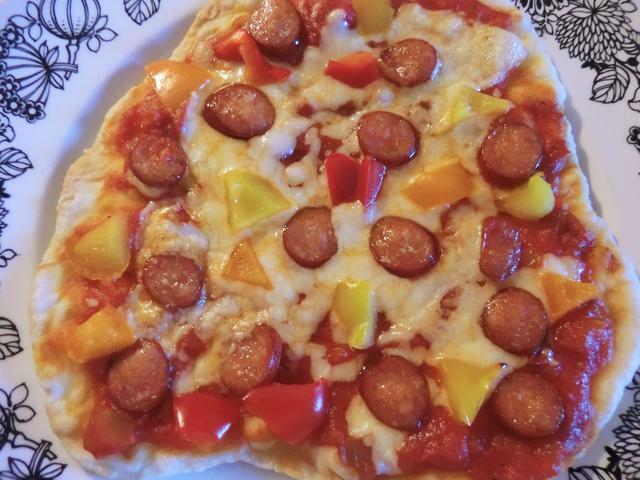 … And here are a couple more tortilla pizzas. 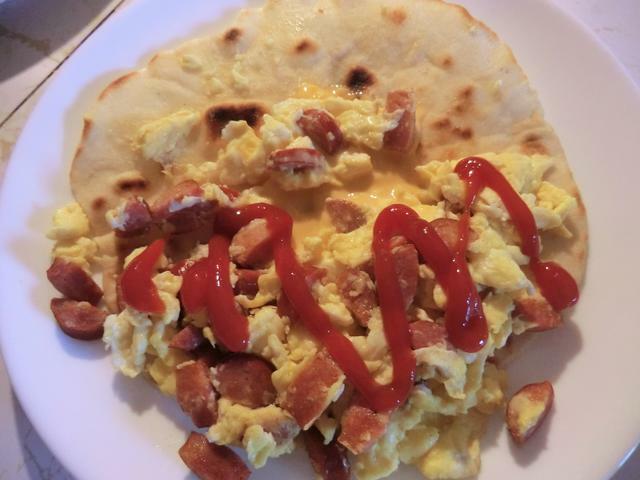 I’ve pretty much stopped making regular yeast pizza dough, or even bread, as these tortillas are much more convenient for a single person. 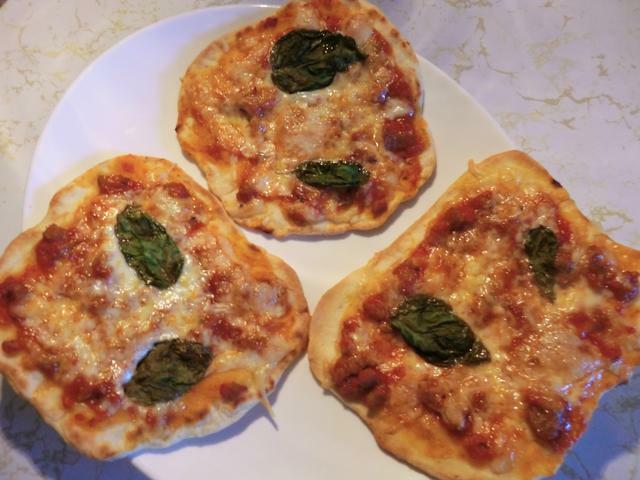 One has bacon on it and the other has a meat ragu sauce base with fresh basil leaves. Two ‘blue’ themed dishes for the last day of the summer holidays. And a link to a song that just says it all. Blueberries have been on sale for the last couple of months so I tossed a couple of clamshells in the freezer … for later. 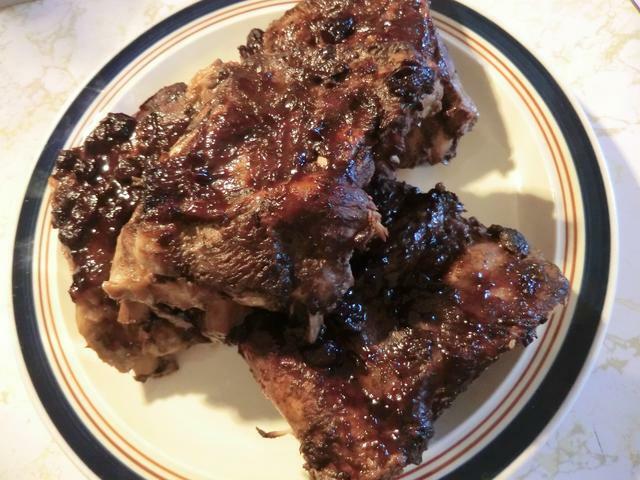 Well, later has come, and I started with a marinade/bbq sauce for the strip of pork ribs I found in the basement freezer. 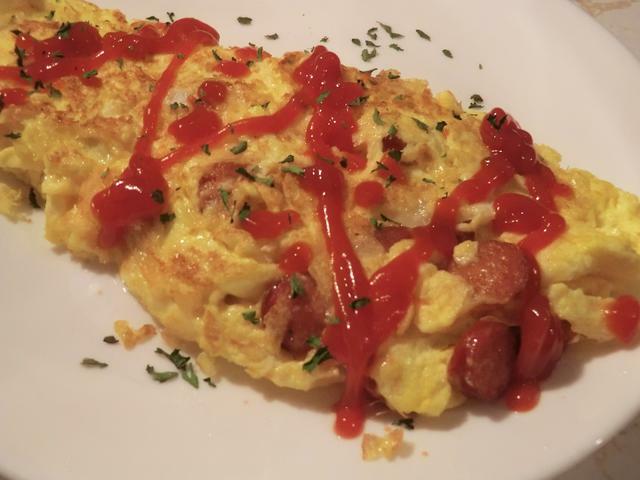 I took the lazy route and didn’t saute an onion and garlic, as I should have. 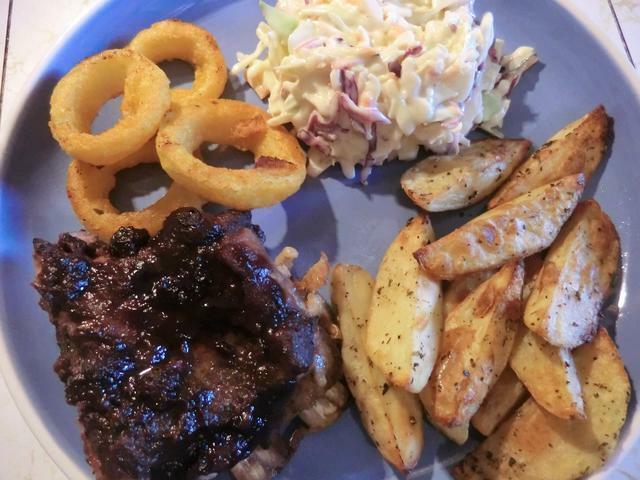 Instead, I added a tablespoon of dry minced onion and a few shakes of garlic powder to a bbq recipe I found on the Blueberry Council website. 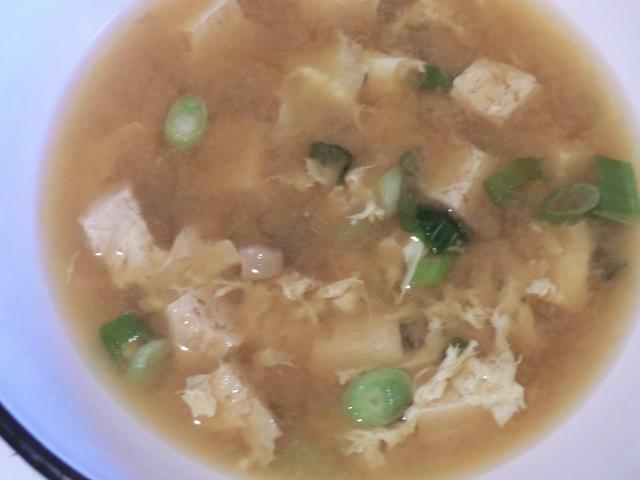 It was a lot looser than I wanted even after I simmered it uncovered (and unattended) for a while. You might want to hang around the kitchen and stir it every few minutes so that it doesn’t catch on the bottom and scorch. Dessert also featured that juicy blue fruit. 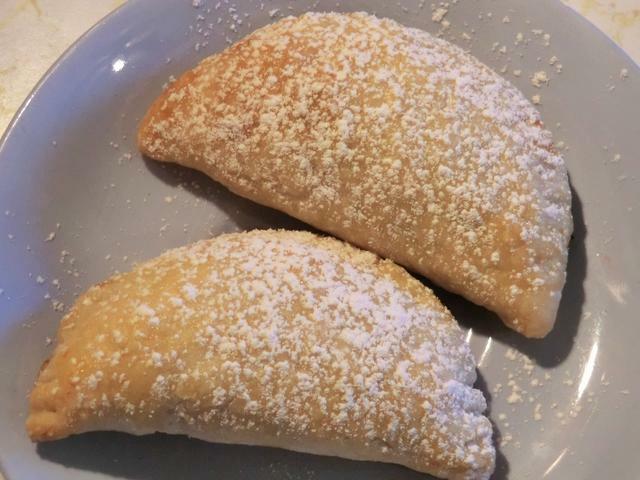 Hand pies using a recipe posted on one of the FB groups I belong to. 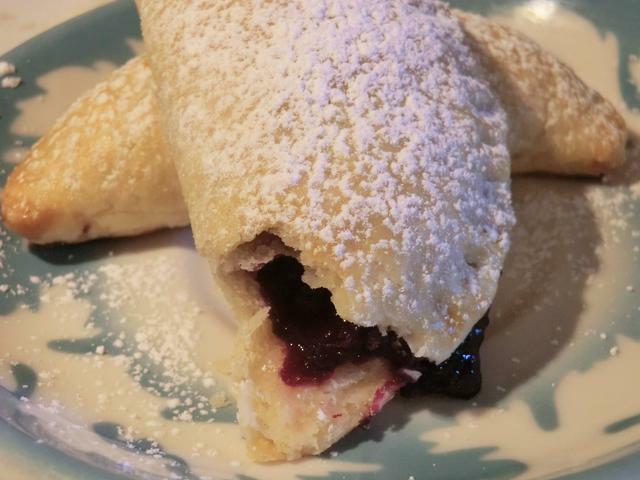 I had halved the filling recipe because I only had two cups of blueberries, but I had more filling than I needed for the hand pies I made, so I made a mini pie with the surplus. 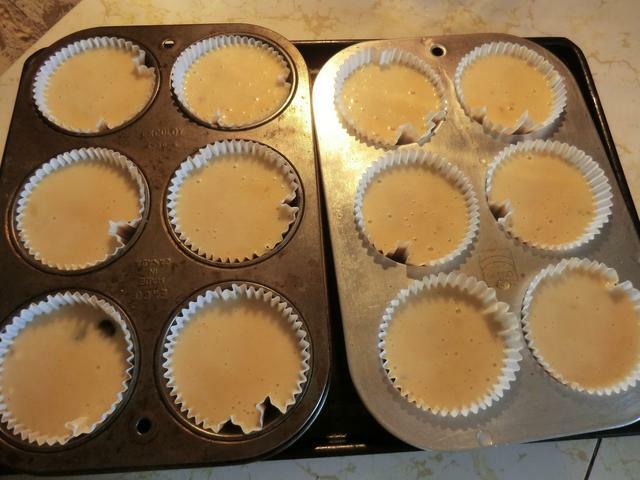 And the extra pastry was shaped into three mini pie shells and blind baked. Disappointingly they shrank quite a bit, even though I refrigerated them before baking. 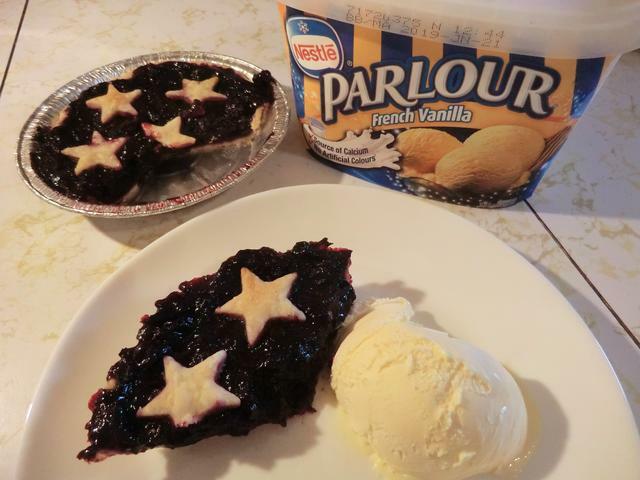 When I serve the mini blueberry pie and decide what to fill those shells with, I’ll share pics. So, I just spent an hour or so doing an inventory of the kitchen (off-kitchen, actually) and basement freezers cause I’ve lost track of what’s in there. 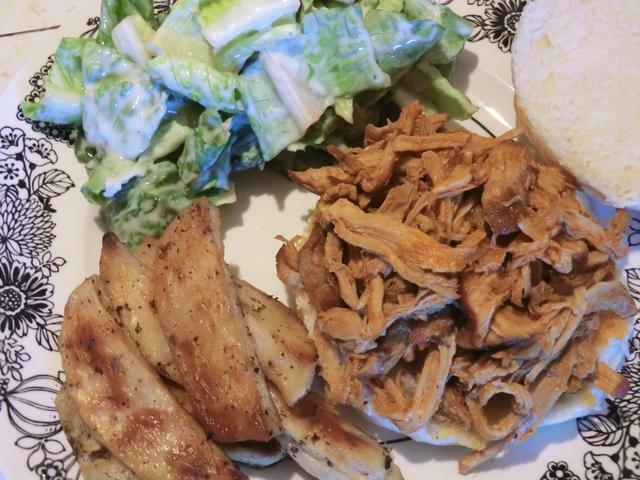 There are several kinds of raw proteins available … chicken drumsticks, a box of pre-seasoned chicken wings, three boneless, skinless chicken breasts, a couple of packages of boneless pork loin, a big bag of large shrimp, and a single sirloin steak. I’m going to see if I can avoid going grocery shopping until the next set of grocery store flyers come in, on Friday, and make do with what’s already on hand. I have no self control when it comes to picking up sale items, to store away in the FREEZER, for the future. My flour canister is almost empty and I’m down to my last 5 lb bag of all-purpose flour in the freezer so I’m not going to do any bread baking until I’m totally out. I may even (shock and horror) BUY some from the bakery or grocery store. 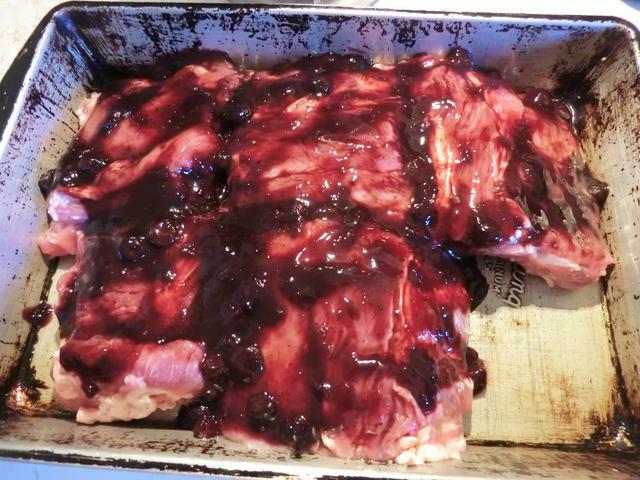 I’ve thawed a strip of pork ribs and will be cooking it today tomorrow.